Wow. So much to tell you about today. The sweet April Korytkowski made scrambled eggs for breakfast and spaghetti for lunch in the absence of the kitchen staff, so Anna and Ethan have eaten decently today in case you’ve been worried about their nutritional well-being! Shortly after breakfast Andrzej and I went to meet with a couple of ladies from his church to plan the “seminar” where I will speak to women who have lost babies (as well as to their families, and friends) – sharing the thoughts I’ve published through my Embracing Grace blog. These ladies have experience doing PR work and went to work after hearing me give a brief description of what I will talk about. A couple of hours later, the entire event had shaped up to be much bigger than I had imagined! It will be held at the public meeting room at the Ostróda city hall, they are putting together fliers to send to all the churches, and an announcement via the town’s LCD Bulletin Board. Tomorrow morning, Andrzej is taking me to the “studio” for the recording of a public service announcement. I started worrying that maybe they had the idea that I’m some sort of famous speaker back in “The States”. They did ask how they should introduce me – counselor? author? I basically just said that I’m just a ordinary person and my only qualification is that I’ve been there. Please be in prayer for this event. As much as I’ve written about this topic and talked about it, I’m a bit nervous! It seems, however, that this may very well be part of the plan God has had for me being here and I am eager to be obedient. Please pray that God will bring the right people to the event who need to hear His message and that I will deliver it in a way that accomplishes His purpose. Finally…. around 6:30, the Holocaust Survivors arrived by charter bus from Warsaw, where they spent the day shopping and site-seeing after traveling from Israel. Just when we were finally getting comfortable with a few Polish words… let’s add Russian to the mix! My “I’m so sorry, but I don’t speak Russian” lead to a few nods and uncomfortable departures, but also a few people speaking broken English to me, so I’ve already identified some with whom I can communicate with on my own. The rest will have to wait for the arrival of the interpreters (four young adults from the Ukraine), who should be here tomorrow I think. We warned Anna and Ethan that they would get fussed over, and they absolutely did. Last year, I received polite nods as they arrived. This year, with both kids (and Lydia) by my side, I was surrounded by sweet little old ladies wooo-ing and ahhhh-ing over their hair. Touching them, hugging them, patting them on the back, and one even kissed Ethan (much to his displeasure!) I recognized several faces as returnees from last year, including my friend Erika. I’m not sure she remembers me, but I hope to talk to her tomorrow. After dinner we had our first session with them, in which Ben and I were introduced. Ben explained who were are, where we are from and that we are there simply because we have a love for Poland, for Israel and for God and are there to serve them. I hope that becomes evident in our actions this week. This entry was posted in On The Field Update, Prayer Requests and tagged Christian camp, Embracing Grace, Holocaust survivors, infant loss, ministry, mission field, stillborn. 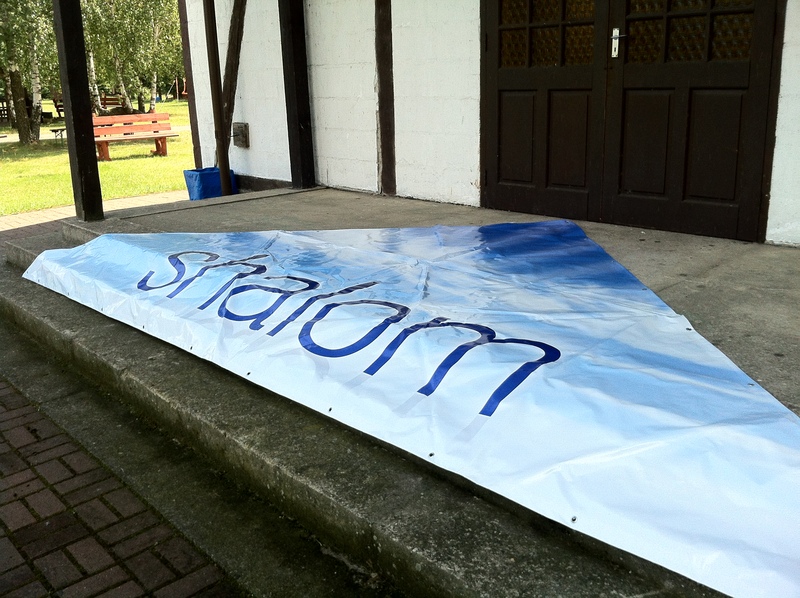 Our second full day at Ostroda Camp was another day of trying to catch up on sleep and serving in quiet ways. Anna and Ethan were both VERY difficult to get up this morning. It’s hard to go to sleep at 10:00, when it feels like just 4 in the afternoon to you! So after breakfast I took Ethan to take a nap. He slept for 2 1/2 hours and was a much happier guy when he woke up. 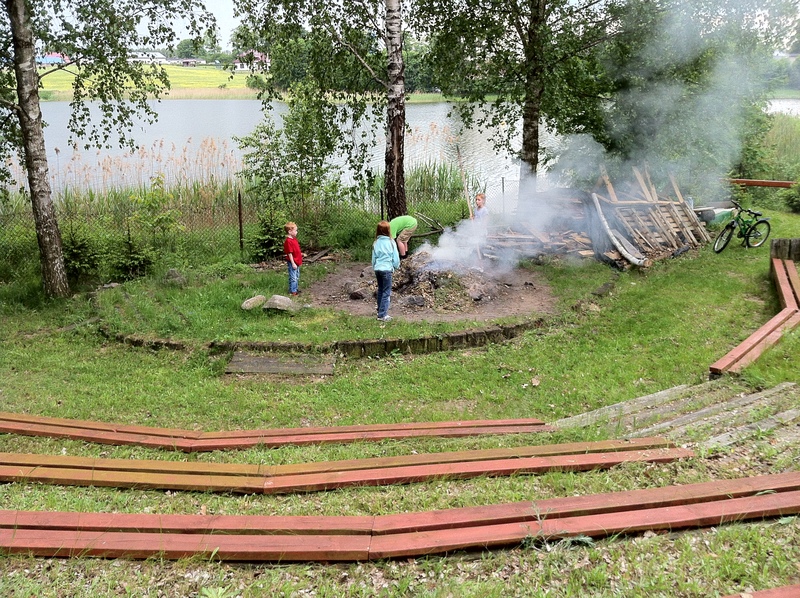 After obiad (lunch), we picked up sticks again and started raking the amphitheater/campfire area. An incoming storm brought the work to an end early, so there is still much to do with this job tomorrow. Hopefully it will dry out quickly or it will be very extra dirty work! A quick item for prayer… either I slept weird or did something to my neck while I was raking. My spine is killing me from about mid-back up through my neck. Please pray that it’s better, not worse, in the morning! I don’t want to be unable to finish the task! This evening the children participated, and I got to help a little, with Bible Club. This is a weekly meeting for the local children that was started by Matt and Laura Perkins when they interned here last year. We got to work with Matt and Laura on our last visit last June, but they were with Ostroda Camp until Thanksgiving! The The Korytkowski’s continued it at that point, and were able to minister to a dozen or so children through the entire winter. This was their last meeting until fall. The children come to play games, hear a BIble lesson, do a craft and eat snacks. 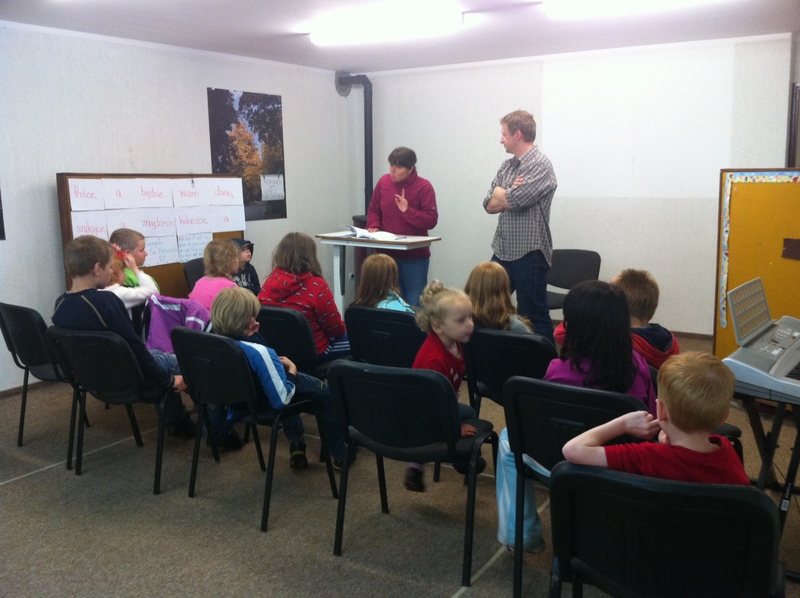 There were several children who were faithful attenders and who have learned much about God’s Word since last fall. 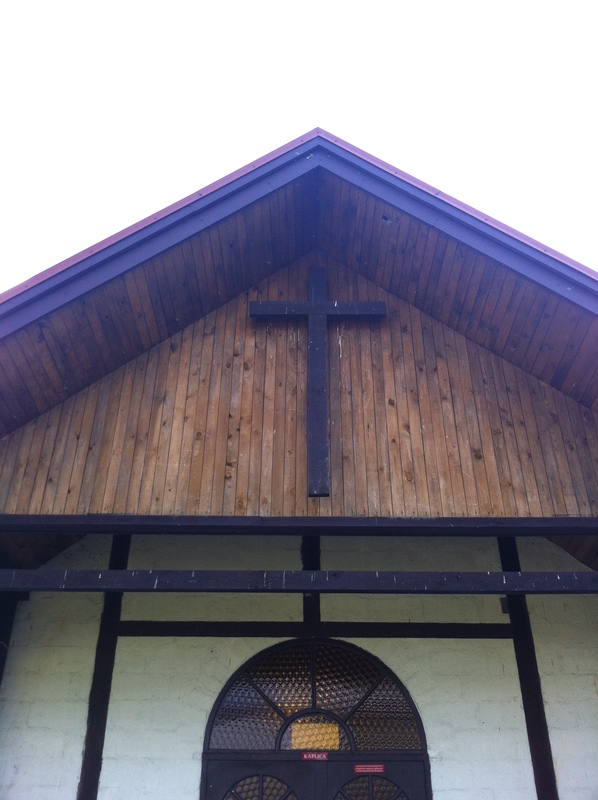 Ben is still out visiting churches with David Hatfield and will return Sunday. It sounds like all is going well with those discussions, but we sure do miss Daddy. Not to mention that the fire pit really needs his magic touch! We’ll be glad to have him back with us in a couple of days. As I was writing this blog post, Andrzej came as asked me to speak for a special event he would like to have while I’m here for women who have lost babies. Please be in prayer for this opportunity. I welcome it, but I’ll need God’s words to flow through me and for Him to lead those here who need to hear the message. This entry was posted in On The Field Update, Prayer Requests and tagged Bible Club, infant loss, mission trip. Poland, serving, stillborn.